Brakhage enlarged the field of the film figurativity as no other artist made it. He was a poet of his medium, an artist attentive to the plastic potentialities given by his tool first. Author of numerous theoretical texts, among which Metaphors On Vision (1963, trad. fr. editions of the Centre Pompidou, 1999), he also wrote in-depth texts on the technology of the film, the splice, 8mm format, the different qualities of the film strip, the techniques of printing, in brief poetics of film-making. In this vein, Paris Expérimental published in 2002 a french translation of his famous text A Moving Picture Giving and Taking Book (1966). Ten years after his death, and even though a part of his oeuvre was consequently published on DVD by American publisher Criterion, it appears necessary today to have an exhaustive inventory of his films to measure the largeness of his work, but also be able to locate – in the epoch of virtual information – the physical copies of its films. Indeed, bibliography on Brakhage, although considerable, often comes back to take into account only some masterpieces giving so a reductionist picture of the work, more various and complex, with many unknown films, of which the catalogue will give an account. 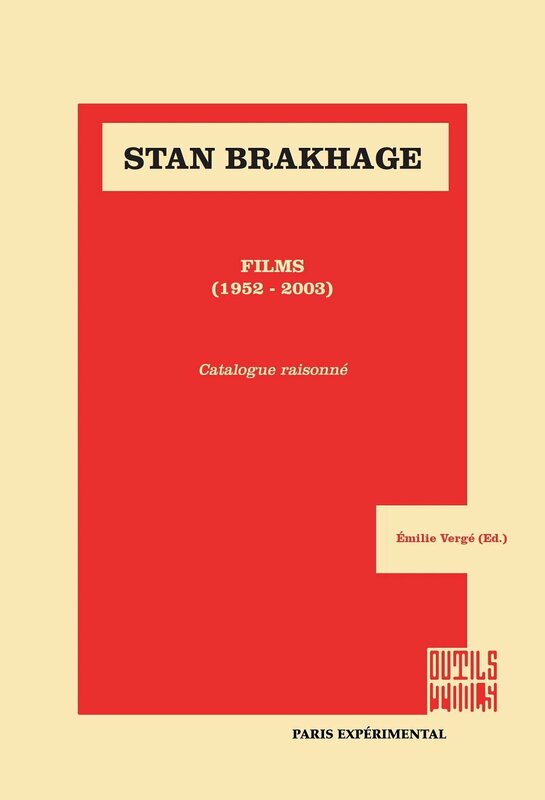 There is to this day no catalogue raisonné of the work of Brakhage, but only a commented list (A Guide to References and Ressources), published in 1983 and the film-maker made films until 2003. The catalogue raisonné is a tool for researchers, academics, theoreticians, art critics, curators, enlightened amateurs. Just like the catalogue raisonné published before by Paris Expérimental for Jonas Mekas, it’s also a « fine book », with more than 100 coloured illustrations. Accomplished with the essential support of Marilyn Brakhage, his second wife and heir, the catalogue is introduced and directed by Emile Vergé, one of the best European specialists of his work. An unpublished text by great American critic P. Adams Sitney is giving a synopsis of Brakhage’s filmmaking career . A biography and a selected bibliography are enclosing this book of reference, illustrated with rare filmstills provided by Fred Camper.